Frolic with finned friends and create your very own fish aquariums with hundreds of accessories. 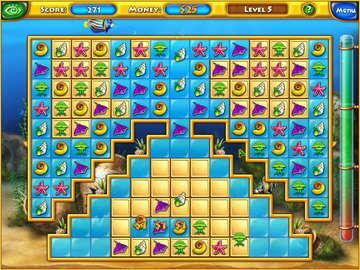 In Fishdom, build your own underwater fish kingdom and customize it how you wish while playing fun Match 3 boards. In Fishdom H20 Hidden Odyssey, join a young marine biologist on an amazing quest to find over 1000 objects and use the proceeds to create your very own stunning aquarium. Both games offer great escapes with completely different game styles. Whether its Match 3 or Hidden Object that you prefer, you're sure to have a great time figuring out how to build out all of your custom aquariums using over 100 aquarium enhancements. What's more, you can earn lots of wonderful bonus items including colorful screensavers for your desktop! You know what they say about double packs, twice the fun for a price of one. Here we have just that, a double pack of Fishdom series that will show you the charms of creating an underwater kingdom and enjoying its beauties. I’ll start with Fishdom , the first game and then the sequel, Fishdom H2O: Hidden Odyssey (TM) . Everybody has seen a fish tank in their life sometimes, and some of us have it or had it. For those who don’t know having a fish tank is a plenty of maintenance work. You wouldn’t believe what needs to be done to keep them clean from dirt and germs. Luckily in virtual aquariums they leave that part behind and you don’t have to worry about those things. Fishdom is a game about creating different aquariums and to test creating skills you possess and to see how far can your imagination go. This game is like any match 3 games out there. You are given different tiles in a grid board, and your job is to match them in 3 or more combinations. The goal of the game is to collect all of the golden tiles on the grid and you do that by making matches on top of them. The level is over when all of the gold tiles are earned. Some tiles are silver, and these squares must be matched over twice to clear. Not to make it too easy, you will find a couple of tiles locked with chains, and sometimes with double chains. If you want to clear them, they must be part of a match. Of course to add some edge to the game a timer is set, and you have to finish up before the timer ends. It’s not that difficult to finish up the game in the predicted time. You can earn a variety of explosive power ups when five or more tiles are matched simultaneously. Ignite an explosive by double clicking on it or swapping it with any other tile. Firecrackers destroy everything within a 1 tile radius, and appear as a result of 6 or more matching, falling tiles. Depth bombs are earned by matching six tiles, and knock out everything in a two tile radius, while dynamite charges can clear out everything in a three tile radius. But the power-up that makes the big Ka-Boom, in fact that helps you the most is the Lightning Bolt. To earn a Lightning Bolt, 7 explosives must be used, after which the Lightning appears and swapping in with the tile you want, destroys every tile of that sort of the board. You will be collecting cash at the end of a stage, and of course if you get to win a bronze medal you get another aquarium to decorate. In the top right corner, you'll see three meter gauges measuring the progress of your tank. Filling up all three gauges for fish, beauty, and comfort will earn you a bronze, silver or golden trophy. You will be spending a lot of that cash on the decoration of the aquariums and for the fishes and so. You can later use the aquariums as screensavers for your PC. 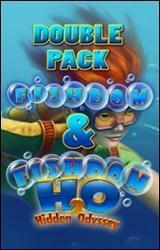 As for the second part of the game, a beautiful underwater world awaits you in this sequel to Fishdom. Hidden Odyssey from Playrix Entertainment replaces the match-3 gameplay of its predecessor for a fantastic hidden object game. Help Jennifer, a young marine biologist, win the Best Aquarium Award. She is finishing her degree at the Environmental Protection University and is bent on proving herself so that she bags a job at Old Barney's aquarium, a prestigious marine conservation center. So she agrees to prove her mettle during the trial period and seeks help from her grandfather who is an experienced oceanographer. 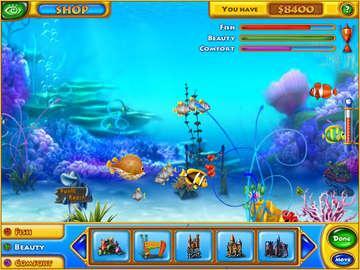 You play Jennifer in this funny game and help her to maintain and create an exotic aquarium. To buy new fish and beautify the aquarium you would need a continuous cash flow. So time to delve deep into the ocean and look for treasures!! Play challenging levels of searching for hidden objects like sweaters, pearls or guitars, thus freeing the water from potential sources of pollution as well. There are special Gold Rush levels and Quick Eye rounds to add diversity to the main game. In the former you have 30 seconds to collect as much gold as you can and in the latter, the timer is set to 15 seconds for you to spot three items from a list. The hint system in the game is quite innovative and a visual treat so you get to play games for free incorporated into underwater splendor. There is a seahorse jar which you can click to release a sea horse which helps to locate a hidden object. Find more of these creatures for extra hints in a screen. There are about 1000 different items to find making the game thoroughly enjoyable. You can use the money you earn to decorate the aquarium and keep your fish happy. Buy different accessories like plants, shells, corals or comfort items like air pumps, filters or new varieties of fish like pipefish, clownfish and add them to your aquarium. You can earn two types of trophies for each aquarium. A star trophy (given if all three stats reach 100%) will allow you to unlock a new tank, but you can keep improving your old tank in order to earn a cup trophy. But beware of making too many random clicks while on your search as that might result in a group of goldfish releasing loads of bubbles and reducing on-screen visibility. As many as there are games to play online you won't enjoy them as much as a fully interactive and customizable environment with 3 themed aquariums to design and 20+ amusing sea creatures. A screensaver feature within the game reflects your progress in the game, so you can see the actual plants and fish that you've earned. 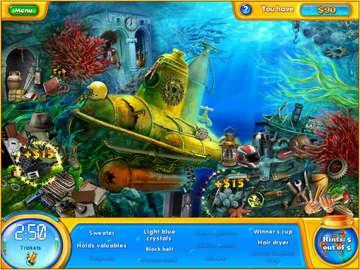 A fabulous game with spectacular graphics and animation and a unique hidden object gameplay in an underwater setting. Embark on a journey 20,000 leagues under the sea!!! You will discover that this double pack will make you work your way through different genres, but also provide with enough fun so you don’t get bored at all while playing.